InstaPress is a photoblogging theme aimed at Instagram and photo enthusiasts who want to use WordPress to show off their photos and galleries in a stylish fashion. 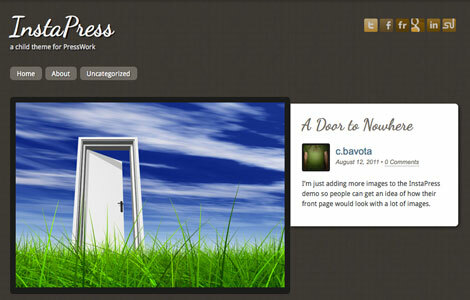 The theme has a similar look and feel to Instagram and makes use of all the great features PressWork has to offer. All our themes are built with the power of PressWork, fully loaded with easy-to-use features like a front-end drag &amp drop editor. BriefCaseis a suite of advanced plugins for PressWork that comes bundled with all of our premium themes. Briefcase adds extra functionality to help you make the most out of PressWork. A good design or theme should adapt and respond beautifully to any device, not just a browser. With media queries your blog or site can be viewed on any portable device such as smart phones and tablettes. A .psd file is a source file for Photoshop, a graphic editor that is used by most web designers. You will (usually) need these files if you want to customize your theme: change the logo, change some graphic elements, etc. 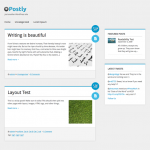 Solid Framework All our premium themes are built using PressWork, so you get all PressWork has to offer and more. The Future is Now! 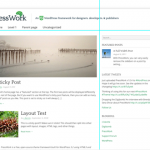 PressWork and all of our premium themes are coded using 100% valid HTML5 & CSS3. Support Forums All PressWork members get full access to our support forums. Google Fonts Why use boring old web-safe fonts when you can choose from the top 20 Google Fonts? 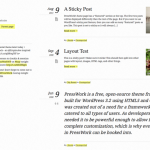 Detailed Themes What good is functionality if it doesn’t look awesome? Our premium themes offer both. 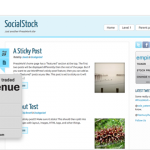 We Love WordPress! That’s why PressWork is free and open source!